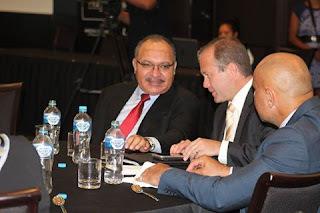 Prime Minister Peter O'Neill said there will be imminent changes at Papua New Guinea's foreign missions. Speaking at the inaugural NBC National Press Club in Port Moresby today, Mr O'Neill revealed that PNG's embassies and High Commissions have been living beyond their means, and overspending with lucrative living. Mr O'Neill also said some representatives have overstayed their 4-year term and all these need to be reviewed. Mr O'Neill's comments followed a statement from the acting Secretary of the Department of Foreign Affairs, William Dihm that a K15 million cut to its budget will affect its operations this year. The Prime Minister further said the Government will now be directly handling funding for the country's foreign missions.